Raising public and policymaker awareness of the importance of infrastructure to the U.S. economy and job creation, our quality of life, safety and our communities, was the focus of a series of week-long activities in the Nation’s Capital and across America. ARTBA and more than 100 other allies celebrated “Infrastructure Week 2016,” which included a kick-off event hosted by the U.S. Chamber of Commerce. ARTBA Foundation Vice Chair Paul Yarossi, president of HNTB Holdings, Ltd., introduced Deputy U.S. Transportation Secretary Victor Mendez. Yarossi noted the importance of distributing reliable information to the public on the value of infrastructure investment, and highlighted the role Mendez played in establishing the Federal Highway Administration’s “Every Day Counts” initiative in 2009. The initiative aims to speed up the delivery of transportation improvement projects. 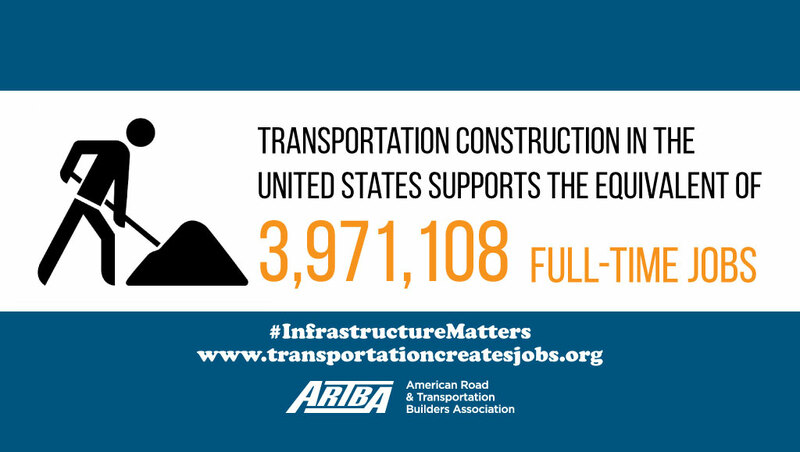 During the week, ARTBA launched a social media campaign with a series of tweets and infographics to illustrate the importance of the transportation construction industry to the economy and linking to the www.transportationcreatesjobs.com website. ARTBA’s tweets were shared more than 80 times. ARTBA also urged its members, through its grassroots action center, to contact their members of Congress and urge them to sign the Graves-Norton Highway Trust Fund (HTF) letter and make a permanent HTF fix part of a tax reform proposal slated for release in June. The week featured press briefings and policy discussions led by U.S. Secretary of Transportation Anthony Foxx, U.S. Department of Homeland Security Secretary Jeh Johnson, several former U.S. transportation secretaries, a coalition of U.S. mayors, and Sen. Shelley Moore Capito (R-W.Va.), Sen. Ben Cardin (D-Md. ), Rep. Garret Graves (R-La.) and Rep. Sean Maloney (D-N.Y.). “If America is going to be that country that can defend itself globally, infrastructure matters,” Cardin said. “I’m proud of the fact that we passed the FACT Act, but funding remains an issue,” added Sen. Moore Capito. Rep. Graves noted there are a lot of issues Congress can “fight about in Washington, but infrastructure is certainly not one of them,” while Rep. Maloney said Congress has a responsibility to lead on this issue. A recurring theme, reiterated by several of the former U.S. transportation secretaries, was the need for increased funding at the federal level. “Our infrastructure in America is broke,” said Ray LaHood. “At the end of the FAST Act, we’re looking at a hole of $100 billion, according to the Congressional Budget Office,” added Jim Burnley. Mary Peters noted a “federal need to invest more spending in transportation.” Many said the underfunding has led to the decline in America’s infrastructure ranking globally. “If we’re serious about getting back to number one, we need to fix the Highway Trust Fund. This is a responsibility of the federal government,” LaHood said, pointing to national governments in Europe and Asia that are significantly boosting investment in their infrastructure while the U.S. has fallen behind. CASE Construction Equipment Vice President of North America Scott Harris launched the company’s “Dire States Equipment Grant” at a May 18 press briefing. The grant will provide $25,000 in equipment support to one deserving village, town, municipality or county to go towards the construction or repair of infrastructure in the community. Read more. More information on Infrastructure Week can be found at http://infrastructureweek.org/.